I’m a bit late on this month’s Glossybox due to some postage issues, but here we are, better late than never! 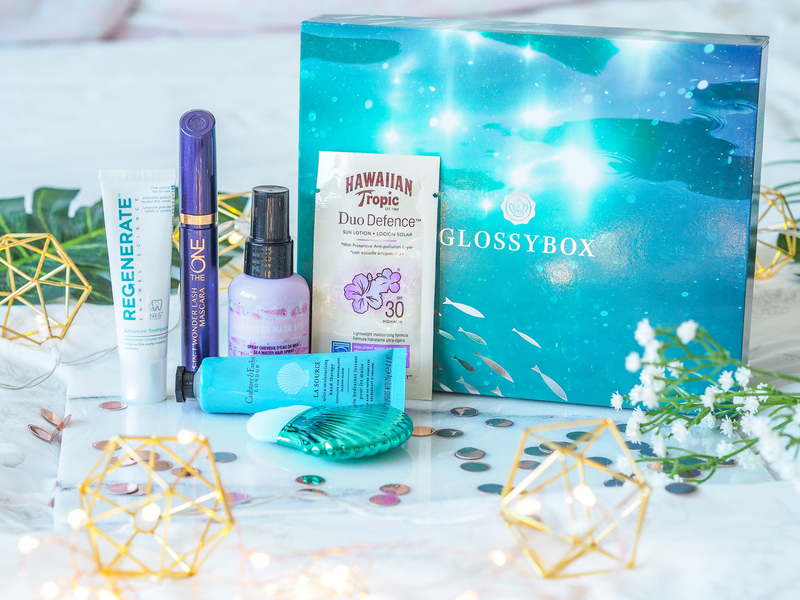 This month’s Glossybox theme was under the sea which I am totally here for, and I can definitely see the theme come into play with some of the products featured. 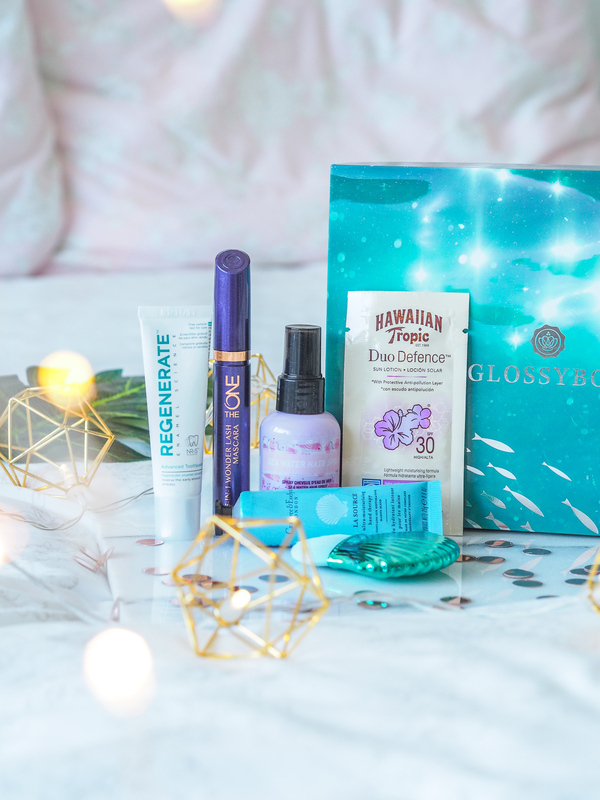 The contents seemed less than normal, but I think that’s because the last Glossybox I received was the Vegan Glossybox – a limited edition, more packed full box as opposed to one of the monthly subscription boxes. The first under-the-sea themed products in July’s edition was a mini Senhor Do Bonfim Sea Water Hairspray. This 50ml of product normally sets you back £18!! and is used to create perfect beach girl waves – just like you’ve spent the afternoon in the sea! It’s also supposed to have a delicious scent of musc and care for your hair too. I’m keen to give this a go because I love giving my hair that extra bit of texture. It’ll be interesting to see how it leaves my hair feeling though! Next up is this adorable little Inuit Shell Brush. This cruelty-free and vegan brush costs a pretty steep £15 and is designed for applying powder and blushes. I think this is adorable, and super cute to look at though for me I can’t help but think it’s going to sit in my drawer and not be used. The brush shape isn’t one I usually use and I don’t feel like I’m lacking it in my brush collection either. It’s a super cute addition to the box but I simply don’t think I’ll get any use out of it. Next in the box, to get those pearly whites is the Regenerate Enamel Science Advanced Toothpaste. This costs £2.50 and is an advanced toothpaste, powered by an exclusive and clinically proven NR-5™ technology. This will be the perfect little addition for my ‘travel drawer’ – my drawer full of mini’s ready for my next overnight adventure! I don’t think there’s enough product in this mini version to see any results, but it’ll be good to try nonetheless. I was so pleased to see another hand cream in the July box. This is a 25g tube of the Crabtree & Evelyn La Source Hand Therapy Cream. This costs £18 per 100g tube and is infused with macadamia nut oil, shea butter and seaweed and algae extracts. This intensive cream nourishes skin so it’s noticeably smoother after each luxurious application. I chucked this on my bedside table immediately and have been using it for the past week. Unfortunately, I’ve not been as impressed as I’d have hoped. This moisturises my hands in the short term, but it doesn’t perform quite as well as other hand creams in my collection. I’ll keep it on my bedside for now but won’t be purchasing the full-size tube anytime soon. Very suitable for the weather we’re experiencing here in the UK right now is the Hawaiian Tropic Duo Defence Sun Lotion. This is a sample sachet, whereas a full-size 180ml bottle costs £14. This is Hawaiian Tropic’s first anti-pollution sunscreen which helps to protect skin against the damaging effects of the sun and pollution and features the signature Hawaiian Tropic scent. Formulated with green tea extract to form a protective anti-pollution layer on your skin, the formula, infused with mango, guava, papaya, and passion fruit provides indulgent protection that instantly transports you to the tropics. I’m keen to give this a go, but I can’t help but feel a sachet like this is really impracticle. I’d much prefer a sample in a mini tube or tub, but perhaps that’s just me being picky!! The final product was the Oriflame The One Wonder Lash Mascara. Upon opening this mascara I was super excited to give it a go. It has a really thin brush/head which I knew would just grip my lashes and give them that lovely fine looking length. This isn’t too pricey at £10.50, and is described as a multi-benefit mascara. Defines, lengthens, separates and volumises without smudging, smearing, running or flaking. 100% waterproof with an unique double-sidedd brush. I’ve used this a few times since getting the box and I’ve been loving it so far. It seperates my lashes and gives them a lovely thin coating, perfect for day-to-day wear. I’m really impressed and would be tempted to repurchase! 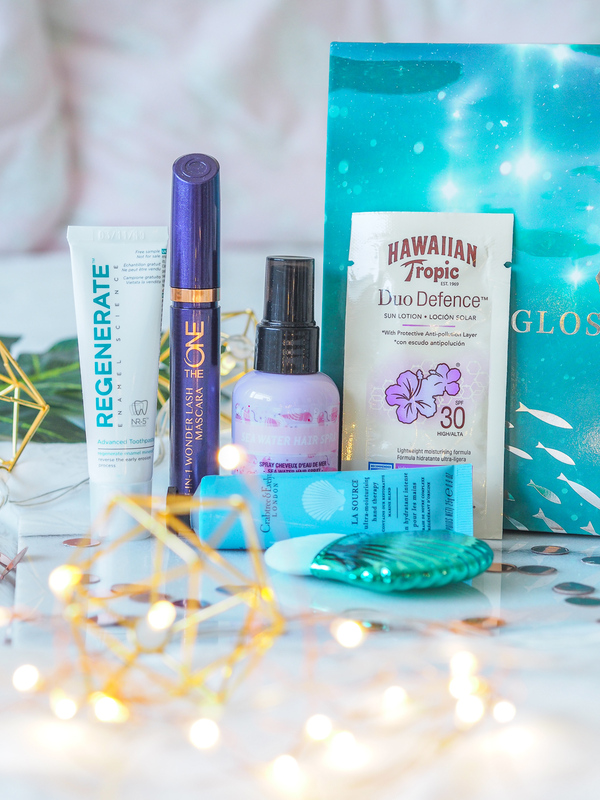 This wasn’t one of my favourite Glossybox’s so far, but nonetheless there were some good products in it! If you fancy getting your hands on this month’s box, or any other’s you can subscribe now and use LUCY15 for 15% off your order! "The products I’m using for a summer glow"